MWC: Nokia launches X Series Android phones | What Hi-Fi? Nokia has announced its first ever Android phones, the Nokia X Series, at MWC 2014. The X Series phones will run "Android apps, Microsoft services and signature Nokia experiences". The Nokia X, Nokia X+ and Nokia XL are aimed at growing markets with affordable prices and lower specs, but even if you're more interested in the higher-spec mobiles, the fact Nokia is launching Android phones is of interest. The X Series takes its OS design from the existing Lumia phones, with a new take on the famous tiles. Apps can be downloaded via the Nokia Store, more than a dozen third-party app stores or by sideloading, which allows you to download apps directly without a store. Nokia HERE Maps, Nokia MixRadio music streaming, Microsoft's cloud storage service OneDrive and Skype are just some of the apps offered out of the box, with various free offers to first time users. 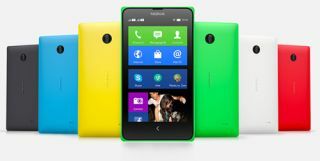 The Nokia X will be the first device released and comes with an 89 euro price, and is set to go on sale from today. The X+ and XL will follow in early Q2 priced at 99 and 109 euros respectively. The Nokia X has a 4in IPS LED, 800 x 480 resolution screen, 4GB memory plus a MicroSD card slot, dual core 1 GHz processor and a 1500 mAh removable battery. It won't trouble the best phones about for pure performance but if you a want a simple to use, no-frills handset, it sounds like the X Series could be an option. Stephen Elop, executive vice president of Nokia's Devices & Services, said: "Nokia has connected billions of people around the world, and today we demonstrated how our portfolio is designed to connect the next billion people to great experiences."